I love spas. In my perfect world, I would enjoy a hot stone massage and facial every week. I would walk around impervious to stress in my zen-like state of mind. Unfortunately, my budget doesn’t allow me to live in my perfect world yet, so spa days are rare treasured treats. But that doesn’t mean I can’t recreate the experience at home. My skin leans towards the dry side, and it seems like I’m always looking for ways to add moisture to my parched skin. I’ve tried a variety of masks and rich creams to ease my suffering. Some have helped while others were nothing more than pretty jars and bottles that took up valuable counter space. After spending too much money on my quest for supple skin, I decided to look for a natural and holistic solution that I could make myself. When you look at a lot of facial products, they seem to consist of unknown, scary-sounding ingredients. Just like people are trying to eat cleaner and less processed food, many of us are searching for natural facial and/or body products too. 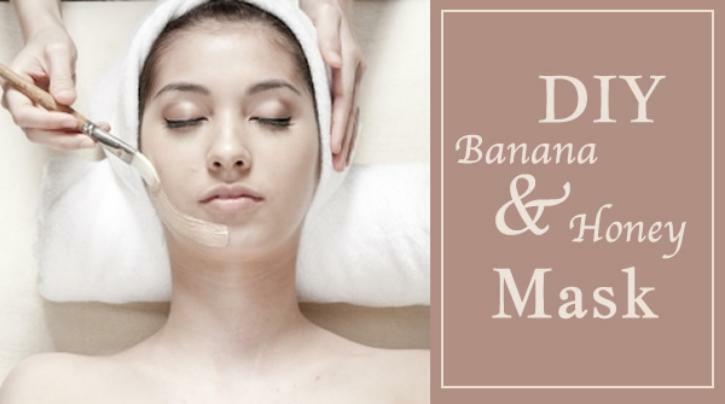 This mask is made-up of two ingredients that you likely have on hand: bananas and honey. Bananas contain nutrients that are essential to your skin, including vitamin C and B6, which help maintain the elasticity of your skin. Additionally, they contain a large amount of antioxidants, which help protect your skin from premature aging. Overall bananas make a great natural moisturizer and will help repair dull, damaged and dry skin, which is why it forms the foundation for my mask. I added a touch of honey because of its antibacterial properties and skin-supporting antioxidants. Thus, it helps prevent acne while also being extremely moisturizing and helps your skin glow and look radiant. As an added bonus, it also helps unclog your pores too. I’ve started using this very simple facial mask several times a week, and it’s really made a difference. My face no longer feels like human sand paper, but is now soft and supple. Plus, I am forced to relax and unwind while I wear the mask, which might just be my favorite part. In a small bowl, stir together the mashed banana and honey until thoroughly combined and a mostly smooth consistency. Store the unused mask in an airtight container in your refrigerator. You can use the remaining banana to whip up a delicious and healthy green smoothie. Please note: If you have sensitive skin, please first test on a small patch of skin to make sure you don’t have any negative reaction. If you are allergic to bananas or honey, do not use. Start with a clean face and pull back your hair in a clip or shower cap. Gently apply mask with your fingers or a brush. Leave the mask on for 30 minutes, then gently rinse and wash your face with a mild cleanser and finish with your regular moisturizer. This feel so great on your skin. It’s cool and refreshing. It may tingle slightly but should not burn or be painful. If that happens, immediately rinse the mask off. It can be a little hard to keep the banana and honey mixture out of your hair, even when you tie your hair back. I recommend using the mask at night before bed, so you can shower any bits of banana out of your hair before you go to bed or the next morning.